Panasonic is set to release another smartphone at Mobile World Conference, bringing out a more premium handset than the Panasonic Eluga. According to TechRadar sources, the handset will be more of a 'camera smartphone' and will have the Lumix tag, so will be using Panasonic's camera technology. 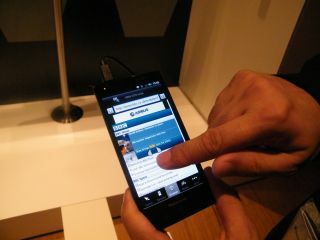 The Panasonic Eluga was shown off at its European conference, which was just a week before MWC 2012. When TechRadar asked the question as to whether another handset would be launched at MWC, the response was: yes, and expect a more premium handset. We're not entirely convinced that this will be the case, however, given Panasonic will want to push the Eluga as much as possible and the fact that Panasonic will have a relatively small part to play at MWC. It's a given though that Panasonic will be launching other handsets but will it really be so soon? Our source seems think so. Although we couldn't get all the details, we were told it will have a non-OLED screen, but will have a front-facing camera – something missing from the Panasonic Eluga – a bigger screen, and will have some sort of Lumix technology inside. This is something that Panasonic has pushed in the Japanese market and it could mean that we see the first proper cameraphone coming from the company. Given that the company has opted for Android, expect to see this on the new handset – hopefully with ICS, an OS which won't be coming to the Panasonic Eluga until the summer. TechRadar will be at MWC 2012, so will get the official word as to when the new Panasonic Lumix handset will be launching.